As a product architect for ———, I had the opportunity to participate in the Office 15 Technology Access Program (TAP) which provided us training and access to the Office 15 platform almost a year ago. I was part of the ——– team that released an Office 15 application called the Gimmal Drop Zone App for SharePoint 2013 in the Office Store that runs on the new App model. An Automatically-Provisioned Azure App is the best of both worlds. It is an App that is designed to be deployed to Azure. This means that it will be hosted outside of SharePoint and can run custom code. However, when a SharePoint Online user adds the App to their SharePoint instance, SharePoint Online tells them that the App needs to be provisioned to Azure, and if they opt to let that happen then the Azure instance will be billed to their SharePoint Online account. So you get all of the capabilities and flexibly server side code without any of the costs associated with hosting it yourself. This was clearly a brilliant plan hatched by the accountants at Microsoft. The Client-Side Object Model (CSOM) was one of the areas into which Microsoft poured a ton of work. SharePoint 2010 had a very limited set of functionality, but the CSOM in SharePoint 2013 really allows you to execute just about any operation you can think of. As you can imagine, you must have a fully-functional client-side API when you are trying to encourage people to move away from using server side code. There are three ways that you can access CSOM functionality, so the deployment model that you are using for your SharePoint 2013 app will determine he option that you choose. GimmalSoft opted for the SharePoint-Hosted App model because our Gimmal Drop Zone App for SharePoint 2013 in the Office Store actually started out as a Silverlight component for SharePoint 2010 and was a natural fit for converting into a SharePoint 2013 app. Azure is a .NET technology, so it makes the most sense to use the .NET API when implementing an Azure-provisioned application. Once again, note that you have the option of using any CSOM API mode that you want in an Azure application, but the .NET CSOM assemblies are the best fit, considering that Azure is running on the .NET platform. What About Authentication and Authorization? A SharePoint 2013 App requests a specific set of permissions when they are installed. If the current user has the ability to grant the App those permissions, then the application can be installed. If the user cannot grant that level of access, then the application cannot be installed. It’s really as simple as that. SharePoint-Hosted Apps have the benefit of using built-in security because they operate on the same domain where the files are hosted. Self-hosted and Azure-Provisioned Apps require the use of OAuth for security purposes. Will My SharePoint 2010 Applications Still Work in SharePoint 2013? Yes. Many organizations have tens of millions of dollars invested in custom applications for SharePoint, and if those applications did not port then Microsoft is keenly aware that upgrading from 2010 to 2013 would be a pretty hard sell. There really wasn’t a fundamental change in how full-trust farm solutions and partial-trust sandbox solutions work, so they still exist and are still supported. If you know how to develop in SharePoint 2010, then you should be able to seamlessly move to SharePoint 2013 using farm and sandbox solutions. 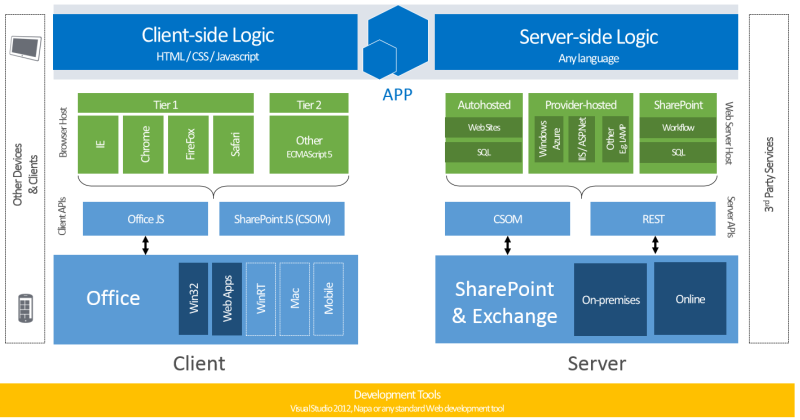 The App model, however, is a new way to develop and opens up possibilities for selling a SharePoint 2013 App to the masses via the Office Store and for preparing for the day when SharePoint is entirely based in the cloud.